I have a large commission project I am working on- a 36 x 24 oil painting of a view to Tuscany through a window frame. To prepare for the painting, I did a watercolor study to help me with proportions etc. Dividing the large canvas size in half made it easy just to double up proportions on the watercolor to scale up for the oil. It also allowed me to have something that was in a fairly finished state for the client to review to get an idea of where we are headed. On this one we didn't have specific photo's that the client provided (although I have thousands of photo's of Tuscany from my many workshops taught there) so she shared what she wanted, didn't want and then gave me artistic license. I found this beautiful blue flow plate in an antique store a few years back with the intention of using it for a still live. It's been sitting on the shelf since then, but when I came home with these rich blue hydrangeas I thought it might finally be time to put it to good use. Maybe there's hope for all the other pieces I've collected for future paintings still waiting for their day to come. This coming week is the 2014 Wesleyan Artist Market. I'll be one of 90+ artists in this juried indoor event with original paintings, jewelry, pottery, and more. Thursday, May 1 7 pm to 9 pm Opening night; everyone welcome! While the flowers from my demonstration in Tuesday's Painting Flowers in Watercolor class were still fresh. I rearranged them in my studio and painted another larger version of Spring Roses shown here in oil. Here's a short slide show of the steps in the process so you can see how the painting unfolded from the initial bouquet and still life set up through the finished painting. This was a demonstration for my Tuesday watercolor class in Atlanta. This semester's course is "Painting Flowers in Watercolor: Loose, Fresh and Easy". Our focus is to simplify, capture the essence of flower using my easy 1-2-3- method. 1-Get the overall shape of each flower or cluster of flowers which communicates what type of flower it is. 2-Define the form -through observation of light and shadow, value & temperature changes. And 3-Add the details as needed and finish off the background. Here's a painting of a bridal bouquet filled with peonies, roses, hydrangeas and orchids. Beautifully designed by Anik Keuller of Anik Designs. Anik is a wonderfully talented floral designer with vision and a romantic, European style that I love. She's got a gentle spirit and is a pleasure to work with. I look forward to creating lasting memories for more of her brides. I've painted this same bouquet before but found a better photo taken out in the sun and cropped in differently for a whole new view of it. The sunlight makes a huge difference. Not a big surprise, but a good reminder that "it's all about the light". In the spirit of impressionism, painting is not about the subject, but rather how the light wraps around the forms and what that light does to our impression of them. The complex and varied shapes of flowers make them intriguing subjects for studying light and shadow. Tuscany is a magical place filled with warmth, history and lots of painting inspiration. 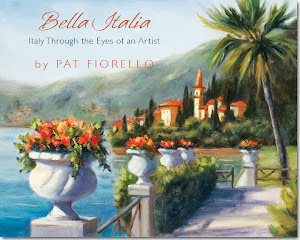 In my book, "Bella Italia, Italy Through the Eyes of an Artist", I share why Italy is so paintable from the perspective of an artist- the light, the color harmony, the rich textural contrasts to name just a few of the salient features. If you would like to experience painting in this beautiful land for yourself, you are invited to join in the fun for a painting workshop I'll be leading there this September 20-27. Each day we have a wonderful home-made breakfast prepared for us, we'll do some painting (with a mix of demonstrations, lessons, painting time on your own and with guidance from me as desired, critiques over the week) and fit in some sightseeing and photography time(and of course a break for gelato). Our days will be completed with a dinner prepared for us in the Tuscan tradition by a wonderful private chef, accompanied by wine courtesy of some of the local vineyards and lots of laughs and good conversation. We are the exclusive guests at a very special place with a rich heritage. San Fedele, has its roots as a monastery dating back to the 12th century and had many reinventions over the centuries up through the time of being a working parish church and community center in the 1980's. Then it fell into disrepair. The present day private owners purchased San Fedele and spent over 6 years breathing new life into the building and surrounding landscape restoring it to its former glory and further updating it to have the modern conveniences to make it a magical and comfortable place for us to call our home base for the week. You will learn more about the history and transformation of this site during our stay. To see more, here's a short youtube video . From San Fedele, we will take some field trips to neighboring towns and villages like Siena and breathtaking spots in the Chianti Region. If you would like to join us, click here to register or find out additional details. Feel free to contact me directly if you have any questions. The program is filling up, but we still have room for you if you'd like to come on the trip of a lifetime! The program is open to artists of all mediums and all experience levels. I have often had complete beginners come for a unique and creative vacation. why not bring a friend, a mother, daughter or sister for a trip you will never forget. This is a painting of a bridal bouquet created by Bloomed to Last a Premier Design and Event Production Company, led by Professional Bridal Consultant Kristi Richardson. Bloomed to Last creates one of a kind weddings for couples getting married in the mid-central region of the east coast, including Virginia, West Virginia, Washington DC and Maryland. A photo of the original bouquet is below. It's quite different from the other bouquet paintings I've done before in that it contains flowers with very dark rich colors, compared to the more traditional white or pastel tones. I chose the square format to come in a little bit closer on the central lilies and eliminate extraneous background. 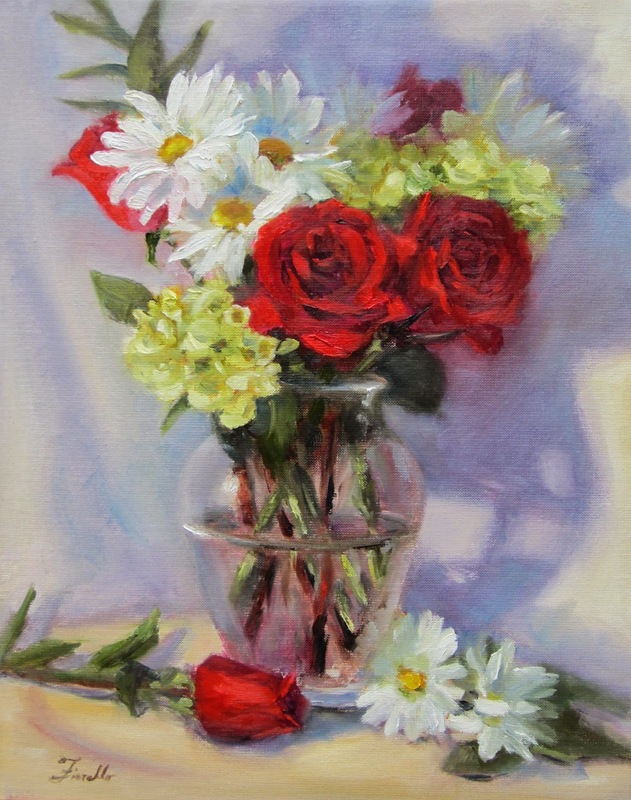 See my "Forever Bouquet Painting" webpage with the details. I still have several spots available for 2014 wedding commissions, so if you are interested, please email me now.